Frontispiece to the 1831 edition of Frankenstein. 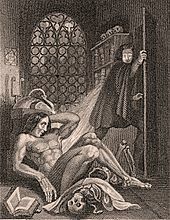 Frankenstein, which depicts a scientist using technology to play god and reanimate a corpse, is considered by many to be the first science fiction novel. I have trouble coming up with an earlier example of science fiction than Frankenstein, published in 1818. So the first science fiction writer, Mary Shelley, is actually a woman, and her creation endures as a true classic of the genre. 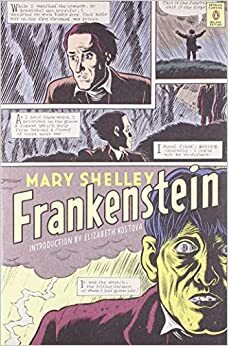 Those who take the time to read the book may be surprised to find that Frankenstein’s monster is not a green bolt-head with a limited vocabulary. Although larger and stronger than most men, he is actually intelligent and an eloquent speaker. After trying to interact with people and being rejected because of his hideous appearance, the monster realizes that no human will accept him and he is doomed to isolation. He becomes obsessed with seeking vengeance on his creator by murdering members of his family. Frankenstein vows to destroy the monster, and the two engage in a chase that finishes in the Arctic. Of course Shelley’s creation endures in films, plays, and popular culture. Frankenstein also spawned several science fiction tropes, including the mad scientist and the monstrous reanimated corpse. Frankenstein represents our continuing fears of meddling with technologies we do not understand. Writer Isaac Asimov coined the term “Frankenstein complex” to describe the fear of robots. Even the term “frankenfood” has been used to refer to genetically manipulated food. Here’s the thing: Just this weekend for my self-proclaimed “sci-fi month”, I thought I’d tackle “Frankenstein”. I read the opening (without actually getting to the “good” parts) and found myself absolutely lacking any desire to continue reading. It’s not that it was bad or anything, it just really didn’t hook me. But posts like this remind me that I will (eventually) have to read some of those books I put off because I got a little bored (especially if they’re classics and tie perfectly into my reading styles [theoretically]). Maybe I need a weekend with fewer distractions…? I think you should give it more of a chance. It’s not written in a style that we contemporary readers are used to, and it definitely takes a while to get going. But if you give it 50 pages or so and still aren’t enthralled, then maybe this classic isn’t for you.